Obama "Science Czar" John Holdren, has a history with the communist influenced journal, The Bulletin of the Atomic Scientists. Of even more concern are Holdren's deep ties to a related organization, the Federation of American Scientists. Holdren has held important posts in the Federation and still listed as a member of the F.A.S. Sponsor's Board. Like the Bulletin of Atomic Scientists, the F.A.S. was founded immediately after WW2, by left-leaning scientists, many of whom had worked in the Manhattan Project to create the U.S. atomic bomb. After the defeat of the Axis Powers, these scientist feared that the U.S. would use their creation against their beloved Soviet Union. Therefore some of them they worked to ensure that the Soviet Union was given every chance to develop better nuclear weapons, while American efforts where countered at every opportunity. Both the Bulletin and the F.A.S seemed to have followed this agenda. J. Robert Oppenheimer - former head of the Manhattan Project. Oppenheimer was allegedly a secret Communist Party member in Berkeley from 1938 to 1942. Oppenheimer's wife Kitty was an ex Party member and his mistress Jean Tatlock, was also a communist. His brother Frank Oppenheimer, and Frank's wife Jackie, were both pre-War communists. Robert Oppenheimer's Los Alamos assistant, David Hawkins, had also been a Party member. Oppenheimer admitted he knew by August 1943 that two of the scientists working under him were Communist Party members. Three scientists under Oppenheimer's direct supervision were later accused of leaking information to the Soviets. Leo Szilard - a key Manhattan Project scientist. As a schoolboy in Hungary, Szilard founded the Hungarian Association of Socialist Students and was an enthusiastic supporter of Bela Kun's short lived 1919 communist revolution. Later, Szilard was involved in a Soviet study group in Germany, before emigrating to the U.S.A. In a 1994 book by Pavel Sudaplatov, former wartime director of the Administration for Special Tasks and an elite unit of the Soviet intelligence service, both Oppenheimer and Szilard were accused of knowingly supplying atomic information to the Soviet Union. Philip Morrison - an assistant to Szilard in the Manhattan Project. A Communist Party member until at least 1942, Morrison was later accused of being a Soviet agent with the code name, "Relay". Edward U. Condon - head of the U.S. Bureau of Standards. In May 1947, F.B.I. Director J. Edgar Hoover wrote that, as late as 1947, Condon had been in contact with an individual alleged, by a self-confessed Soviet espionage agent, to have engaged in espionage activities with Soviet agents in Washington, D.C. from 1941 to 1944. Hoover added that Condon and his wife associated with several individuals from the Polish Embassy in Washington, including the wife of the Polish Ambassador, the secretary of the Embassy, and a former counselor of the Embassy. The latter, Ignace Zlotowski, a nuclear scientist, had worked as a Soviet espionage agent in direct contact with the Soviet Embassy in Washington. Condon was also active in at least one communist front and was an associate of several Communist Party members. Harlow Shapley - a prominent astronomer. Shapley had been involved in at least 25 Communist Party fronts. 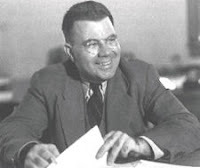 Harold C. Urey - director of War Research, Atomic Bomb Project, Columbia University. Urey was affiliated with at least ten Communist Party fronts and had attended a 1947 meeting in Paris, of the Soviet controlled World Federation of Scientific Workers. In the late fall of 1945, the F.A.S. scored a major political victory. While Congress was debating who should control atomic weapons, the F.A.S. rented a room near the Capitol, equipped it with a typewriter, lobbied Senators and Representatives and talked to reporters. Harold Urey, led the charge, promoting a bill calling for the creation of a purely civilian Atomic Energy Commission, led by a panel appointed by the president- with no military representation. The debate continued into 1946, with the F.A.S. working to make sure the bill passed. To the amazement of many observers, they won, though the bill was softened to allow some military input. Moscow Center was probably very happy, as it was considered much easier to influence or infiltrate a civilian body than a military organization. In October 1950, Senator Joseph McCarthy placed a statement in the Congressional Record charging that the Federation of American Scientists was "heavily infiltrated with communist fellow travelers." In the 1970's F.A.S. described itself as the "voice of science on Capitol Hill". By the 1980s the F.A.S. was working to oppose president Reagan's proposed space based missile defense system. The Soviets were extremely concerned about "Star Wars", knowing that if successful, it would make the U.S. much less vulnerable to Soviet nuclear missile attack. In 1983, a group of Soviet academics had sent an open letter to U.S. scientists, asking whether, in the light of president Reagan's "Star Wars" speech of March that year , there had been a change in the professional consensus in the US, regarding the feasibility of effective missile defenses. Only the F.A.S. 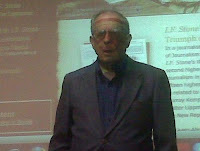 responded and were subsequently invited by senior Soviet scientist, Evgeny Velikhov to visit the Soviet Union. In November, the F.A.S. sent a party to the Soviet Union, which included F.A.S. chairman David W. Hafemeister, deputy chairman John Holdren, president Jeremy Stone and staffer John E. Pike. Velikhov told Hafemeister, that the reason he decided to organize the Committee of Soviet Scientists was to educate a new generation of Soviet scientists about nuclear arms control and to re-open the US-Soviet dialog on strategic defense with the roles reversed. Now it would be the Soviet scientists who would try to convince the the US government, with US scientists as intermediaries that the pursuit of ballistic missile defenses would be counterproductive. Delegate John E. Pike went on to become "one of the country's most credible space industry observers" and an often quoted "security" expert. In the 1980s however, he was a key opponent of "Star Wars". Pike helped form the Space Policy Working Group and the National Campaign to Save the ABM Treaty, to campaign against Reagan's missile defense policies. In 1994 Pike wrote an article entitled "Uncloaked Dagger: CIA Spending for Covert Action" for Covert Action Quarterly, a journal founded by C.I.A. renegade and K.G.B. contact Philip Agee. 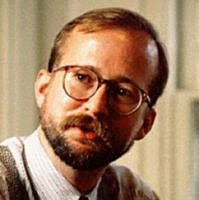 Holdren's other co-delegate, Jeremy Stone was also an interesting case . Stone, who led F.A.S. from 1970 to 2000, has been an extremely influential lobbyist and activist in the "peace" and foreign policy arena. He is the son of radical journalist I. F. Stone, an identified Soviet agent of the pre -WW2 period. Like his father, Jeremy Stone has been close to the radical Washington D.C. based "think tank", the Institute for Policy Studies, once notorious for its ties to Soviet operatives. Marcus Raskin, a co-founder of the Institute for Policy Studies, and Jeremy Stone helped me write the speech. Jeremy was I. F. Stone's son , who had been an expert opponent of ABM since 1963. His opposition to Pentagon spending later earned Jeremy a place on Nixon's enemies list. Evgeny Velikhov was no gray Soviet bureaucrat either. The Soviet Union's top scientist/activist, Velikhov was an adviser to then Soviet leader Mikhail Gorbachev. 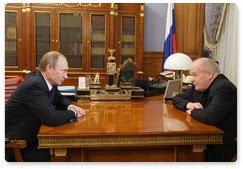 Today he is close to Russia's de facto leader and former K.G.B chief, Vladimir Putin. We respectfully submit the Final Report of the U.S.-Russian Independent Scientific Commission on Disposition of Excess Weapons Plutonium. We strongly urge that the U.S. and Russian governments, with support and cooperation from the international community, take additional steps - beyond those already underway - to more rapidly reduce the security risks posed by excess weapons plutonium, ensuring that this material will never again be returned to nuclear weapons. Our report recommends specific steps to meet this objective, including the technologies that can be used, a step-by-step plan of action for bringing these technologies into operation as rapidly as practicable, an international cooperative approach to financing the program, and establishment of an international entity to coordinate the necessary financing and implement the effort. Today, John Holdren remains listed on the F.A.S. Board of Sponsors. Not surprisingly his Co-sponsors include several interesting characters. Ann Druyan - a former secretary of F.A.S., Druyan is an open Marxist. In 1998 she endorsed a New York event commemorating the 150th anniversary of Karl Marx's "Communist Manifesto". Stanley Sheinbaum - a West Coast philanthropist and supporter of radical causes including Democratic Socialists of America and Progressives for Obama. In 1988 Sheinbaum led a delegation of American Jews that "persuaded" Palestinian terrorist leader Yasser Arafat to recognize Israel's right to exist and renounce terror. Arafat's promises, later graphically proven insincere, helped earn Arafat the Nobel Peace Prize. Mark Ptashne - an Harvard geneticist. During the Viet Nam War, Ptashne was deeply involved in antiwar politics at Harvard and went to the extent of lecturing at the University of Hanoi. In 1978 Ptashne attended a genetics conference in Moscow. 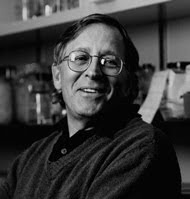 In the 1980s, the scientific director of a Cuban genetics laboratory , spent three months working with Ptashne at Harvard. In the 1940s, Mark Ptashne's father, Fred Ptashne, was a tutor at the Communist Party's Abraham Lincoln School in Chicago. Coincidentally, several of Fred Ptashne's fellow tutors went on to intersect in some way with the career of Barack Obama, including Earl Durham, possibly Bernice Targ and Obama's Hawaiian boyhood mentor Frank Marshall Davis. John Holdren held high office in two organizations shot through with socialists, Soviet sympathizers and "security risks". Both organizations have worked with Soviet officials for policies arguably beneficial to the former Soviet Union and detrimental to the U.S.
Holdren personally collaborated with a key figure in the Soviet/Russian scientific/political apparatus and traveled to the Soviet Union at the height of the "Cold War". 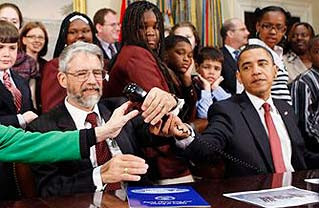 Now John Holdren holds the most important scientific post in the Western World and has the ear of the President of the United States of America. Van Jones resigned his White House post, after his radical background was exposed. John Holdren is in a position to do far more damage to U.S. interests, than Van Jones ever dreamed of. Should John Holdren's past be subjected to at least the same level of scrutiny? Everything Obama learned about diplomacy he learned in kindergarten and it is us, the Americans who are paying for him not learing good lessons in the childhood.